It is not a friendly sound by any means. The sound of a clicking hard drive is probably one of the scariest things that anyone can deal with. A clicking hard drive can emit sounds that are anywhere from a constant ticking to a high-pitched buzzing, all the way to a low thud. This is not a “normal” hum, and is something that most users can tell right away is not a sound that their machine has made before. And if you use your hard drive like most people do, that is to save pretty much all of the important data in your life, that clicking can signal what may be possibly be an imminent hard drive failure. Typically, but not all of the time, the clicking that you are hearing coming from your hard drive has to do with the fact that you have a misaligned drive head. If you want to know more about how hard drives function in general, you may want to check out an article here that describes exactly how the spindle and platter hard drive system works. But basically, your hard drive stores data on a platter, and the hard drive arm (with the head at the end of it) moves across this platter in order to read the data contained on your hard drive. Want a free estimate on recovering your clicking drive? Click here! Typical laptop drive with a typical problem. Now, when you have a misaligned drive head, you are going to get the clicking. This is typically the sound of the drive head scraping across the platter, which as you would most likely expect, is not good. When you have a situation like this occur, your first move should always be to power down your computer. You have to remember that if this hard drive head is misaligned a great deal, it can actually cause an incredible amount of damage to your hard disk. 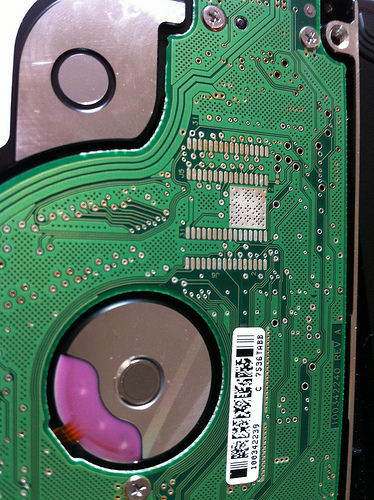 The more that you use your system with a misaligned drive head, the more likely it is that the data contained on the platters becomes unrecoverable. What this can also mean is that when you’re actually looking for professional hard drive recovery, it may end up being far more expensive because of the fact that your drive head was allowed to create so much damage. Check On The Clicking Hard Drive: So Now What Do I Do? We’re going to assume for the purposes of this article that you do not have all of your data properly backed up on an external hard drive. Or, for that matter, at an online backup company such as Carbonite or Crashplan (which of course, are actually very handy to have for recovering the key parts of your data, for future reference). If you do, kudos to you. All you have to do now is simply restore all of your data onto a brand-new hard drive. What we’re saying here is that if your hard drive is actually clicking, you are probably going to have to throw it in the garbage. Is just not worth saving at this point, especially because of the fact that you know that you have all of your data backed up on another drive. What’s more, we can tell you that buying a new hard drive (perhaps even upgrading to an SSD drive) is always going to be better than having to pay for data recovery. Upgrading is always better than “repairing”. The Risky Route: How Fast Can You Go? Now, first the disclaimer: we would never recommend this route. As data recovery professionals, we have seen this particular method destroy quite a lot of data. But, we have also seen it work. Remember though that if you attempt this, you had better be certain that you are going to be okay with potentially losing your data permanently. So… Are you still with us? Are you sure you would just rather contact a professional data recovery technician in order to find out what the safest route to data recovery is? If not, here is what you may want to do. Again, remember that we do not recommend this nor are we liable for any of the actions you take because of this article. There is a possibility that your hard drive is still functioning, but the clicking of the hard drive is obviously a sign that it will not be working for too much longer. So, what you can potentially do is get a Windows startup disk (such as the ones that we used to be a will to create in Windows 98 and 95), and attempt to do a full disk copy from DOS. This is a typically low-end operation and is probably the least dangerous thing to do when you have a clicking hard drive. Here are some good DOS X-copy commands you may be able to use. But again, we did not recommend it here. Much like Mission: Impossible, we disavow all knowledge of the previous few paragraphs. The avenue that most people prefer to take is one in which they can be assured that their data is going to be as safe as possible. What this involves is simply picking up the telephone and calling a professional data recovery technician. One of our engineers can usually assess your hard disk problem in less than two minutes, and give you the good and bad news when it comes to a prospective drive recovery. There are many instances in which a clicking hard drive can actually be repaired completely safely at incredibly affordable cost (a good pricing chart is here). What’s more, any professional data recovery service is at least going to do their best to recover your data. Particularly, if like Hard Drive Recovery Group, that data recovery service does not charge if data is not recovered. And in the end, the advice is free, and is probably going to be a lot better than attempting the risky route to hard drive recovery.